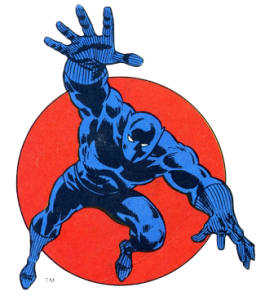 I have been a huge fan of Black Panther…probably ever since I started to read. Back in the 80’s, we didn’t have a lot of Black superheroes to look up to then. Our Saturday mornings were filled with brief glimpses of a goofy Black Lightning wannabe (see “Black Vulcan”) and maybe the Harlem Globetrotters on Scooby Doo. So when I started to read comics and first ran across the Black Panther, I knew I was a fan for life. 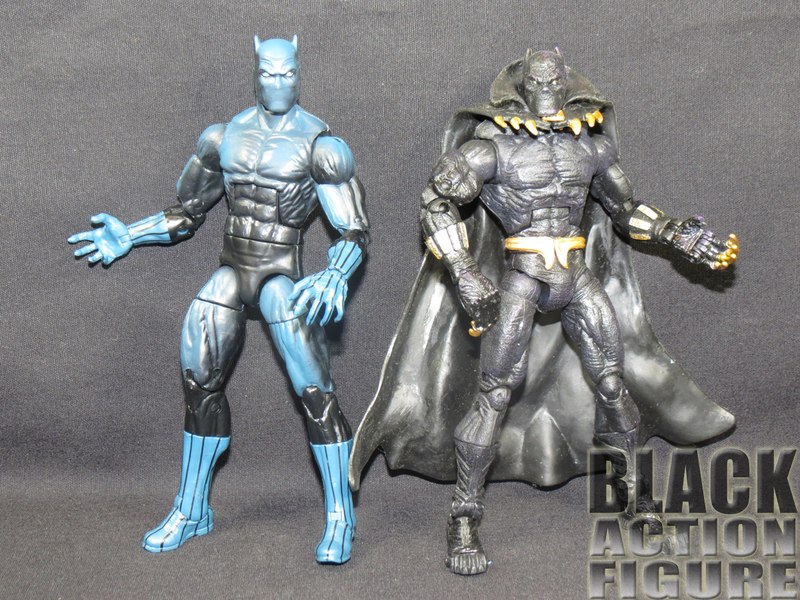 Black Panther is sort of Marvel’s answer to Batman. Look at all the similarities: intelligent, wealthy, they both have pointy ears on their costume…I mean I could go on and on. But Marvel went a step ahead and made the Black Panther into the complicated superhero he is today. 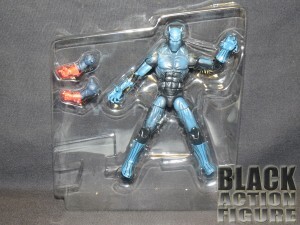 I can’t help but love the Marvel Legends packaging. I’ve said in other reviews how inviting the design is to look at when I see them in stores. I find myself picking up and looking at figures in the store that I already own just because the packaging is so appealing. Nothing is particularly new about the formula. You get a nicely designed blister pack. On the front we get the figure nicely displayed along with not only artwork of the figure, but artwork of other figures in the wave on the side. 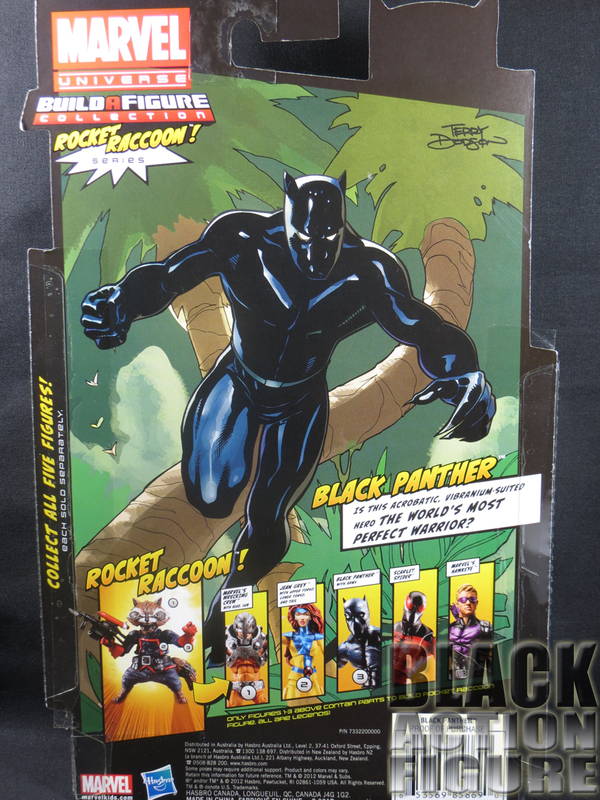 On the back, we get an expanded look at the artwork from the front along with previews of this wave’s Build-A-Figure (the pseudo popular Rocket Raccoon) and the other figures in the wave. I believe just like in other reviews, the packaging loses a point because it is a blister pack rather than a display box that come with some other premium figures like DC Collectibles or even Hasbro’s 6″ Star Wars Black line. Easy enough – none really to speak of. 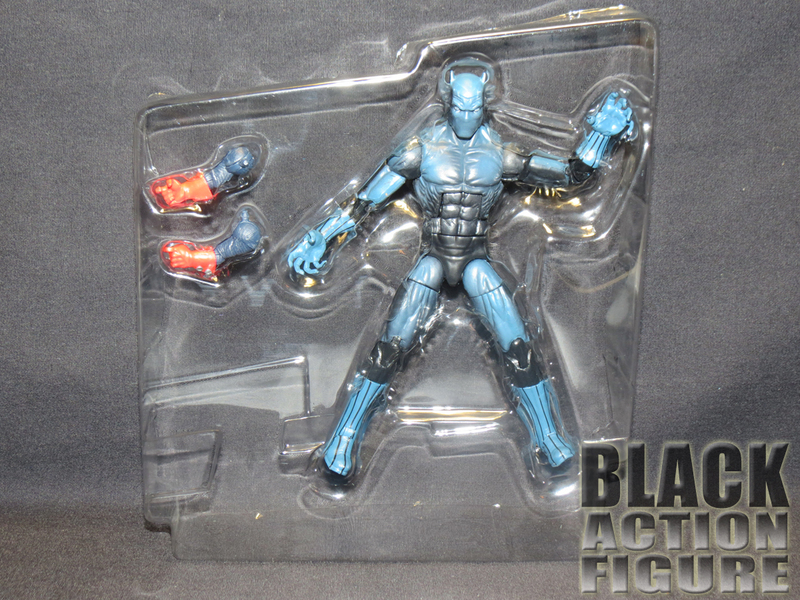 This figure was one of three figures in the line to receive a Build-A-Figure piece for the Rocket Raccoon figure. Black Panther was graced with the arms. Side note: it’s really funny how they pack these BAF pieces because the figure already had his gun, but no arms to hold it with. Maybe it would have made more sense for the weapon to come with the arms, but hey, no sweat off my brow. I finally got all three figures and was able to put him up on the shelf. That’s it. I wonder if I should go into my “why don’t these come with a stand also” tirade. I’m tired of that. Some toy companies want to cut corners and stands were it. I can’t wait until we all have 3D printers. Print our own damn stands. 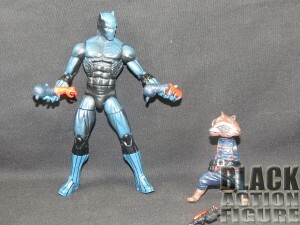 This is actually my second Marvel Legends Black Panther. Although I wasn’t a big Legends collector back in the early 2000’s, I did manage to pick up a Toy Biz Marvel Legends Black Panther. 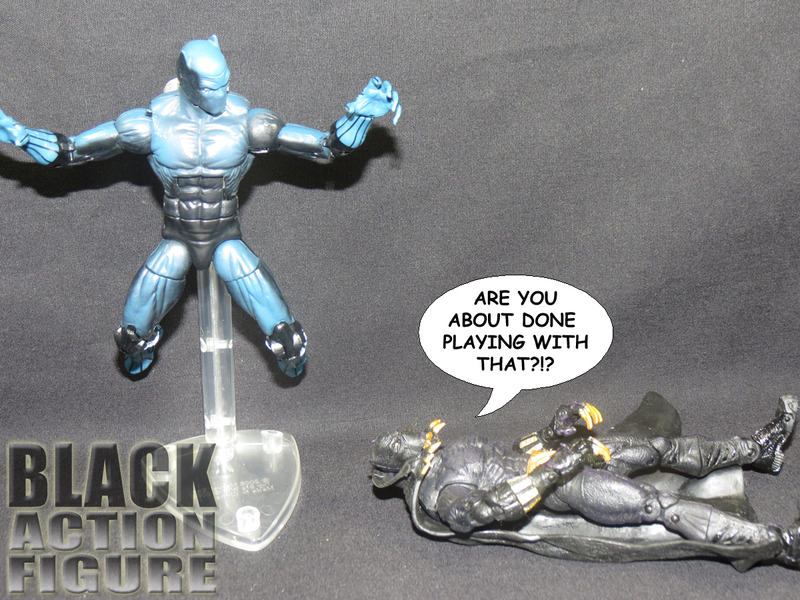 While the Toy Biz version was outstanding in its own right, it suffered from a serious flaw: it was hard to stand up. 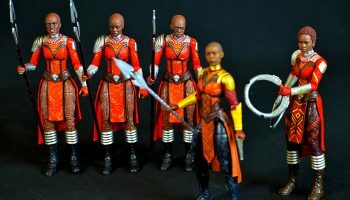 The figure was so off-balanced with a heavy cape that it came with a figure stand that is supposed to prop underneath the cape and stick into a peg hole in the back of the figure (which coincidentally fits the new Black Panther figure as well and is good for aerial shots). Talk about awkward. While the Toy Biz sculpt was based on the more recent 21st century version of the Black Panther, the new figure is based off of his 1970’s/80’s styling. 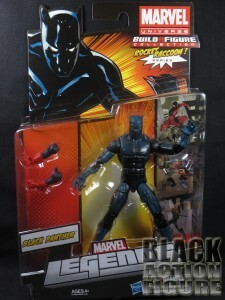 This is the time when I was first introduced to the Black Panther so this is a great addition to my collection. 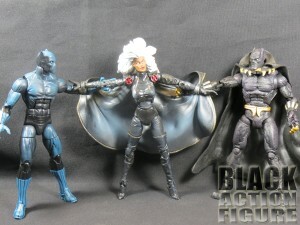 Gone is the regal cape and claws and gold accents on his costume and what we get is all panther. So the sculpting definitely gets top marks. But now here is where we run into a problem. The paint application leaves a lot to be desired. 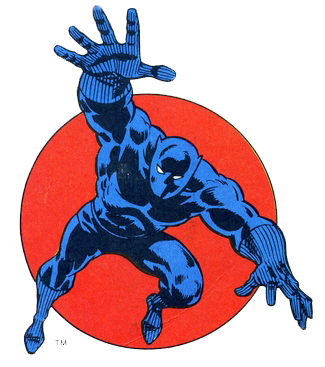 Let me start by saying that artists back in the day would draw the Panther with midnight blue accents. You ever hear the term that it is so black that it’s blue? It’s kind of like that. 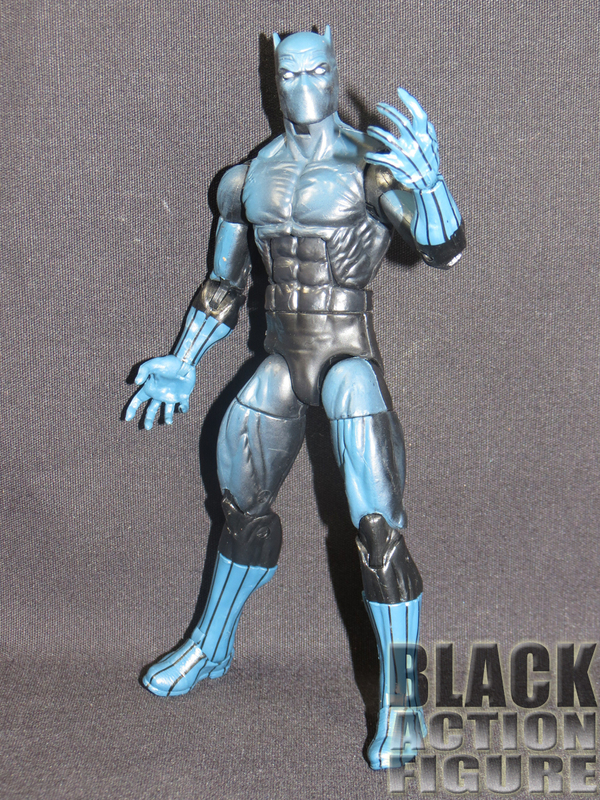 When we first previewed the prototype at the New York Toy Fair, the paint application was close to perfect leaving on hints of blue on Black Panther’s costume. Unfortunately, the final production figure took it way overboard. Instead of midnight blue accents throughout the costume, we get a figure that’s mostly all blue the top third of the body, thighs, gloves and boots. In the picture, the camera flash sort of over-accentuated the blue, but you get the idea. I’m going to give it to you straight. 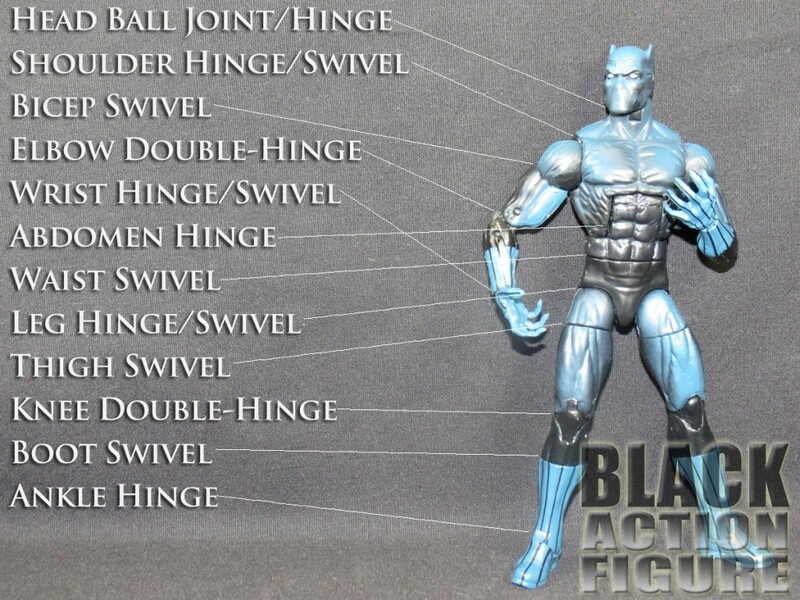 This figure and the articulation should be the basis of all Marvel Legends figures. No joke. Over 30 points of articulation! I personally count about 32. Some of the highlights include an almost fully articulated head that allows the figure to look fully up AND down. The ab crunch in the center also allows for some nice posing. I’m telling you, if the figure was the correct color and he came with some nice Black Panther weapons, this figure would be one of my top picks. I’m so glad that Hasbro was able to get this figure into Production. 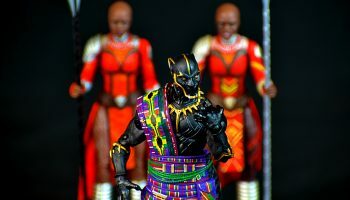 A new Black Panther figure was definitely needed in the line. 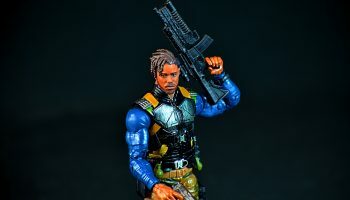 Black Panther the character has played such a pivotal character in so many major Marvel story lines that he deserved to have a figure done of him. Yes, he’s not perfect, but he will definitely fit well in my collection. I look forward to seeing more of the articulation quality down the line (if it can keep holding on with the way Hasbro is screwing with it). 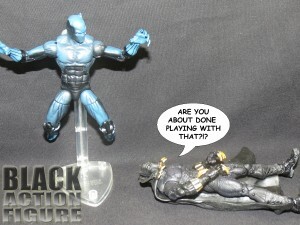 Action Figure Rant: Hasbro, What the Hell Are You Doing?! ?